Making the All NBA 1st Team in your rookie year is no easy feat - going back to 1950, it's only been done 9 times, and only twice in the modern era. With players entering the NBA at a younger average age these days, it's highly unlikely we'll ever see another rookie named to the All NBA 1st Team. Tonight the Golden State Warriors, up 3-0, play Game 4 of the NBA Finals against the Cleveland Cavaliers. Should they win tonight (or in the next four games), Steph Curry will become the ninth player to have won multiple NBA MVPs (2) and multiple NBA championships (2). Tonight the Golden State Warriors completed their sweep of the San Antonio Spurs to return to the NBA Finals for the third straight time. What other NBA teams have reached the Finals three (or more) consecutive times? Presuming Cleveland knocks out the Celtics, they'll be the 8th team on the list, appearing in the Finals from 2015 - 2017 and making the Warriors-Cavs matchup the first time in NBA history where two teams met in three consecutive Finals. Did Rick Barry Ever Lead the ABA in Scoring? Hall of Fame forward Rick Barry is the only player ever to lead the NCAA, NBA, and ABA in scoring. I've heard this statistic quoted a few times before, but after doing a little digging into it I believe that it's technically incorrect (the best kind of incorrect!). Basketball-Reference.com shows Rick Barry as the leading scorer for the NBA in the 1966-1967 season, when he averaged 35.6 PPG in 78 games played. Barry's contract with the San Francisco Warriors ended at the conclusion of that season, and Barry planned to sign with the Oakland Oaks, an ABA team coached by his father-in-law. However, the Warriors had a reserve clause in their contract with Barry (common at the time), meaning that the team retained his rights even after his contract ended. The issue went to the courts (the judicial ones), where it was ruled that Barry had to sit out for a year, but then could play for the Oaks the subsequent year. In the 1968-69 season Barry averaged 34.0 PPG, which was more than any other player in the ABA. But, he only played 35 games that season due to a knee injury. Now, I'm not sure how many games are required by the ABA to qualify for a statistical season leader, but in the NBA it's 58 games (presuming a full 82 game season). So by that measure, Barry did not lead the ABA in scoring that year. And Basketball-Reference.com does not have him as the scoring leader - it gives the honors to Larry Jones, who had 28.4 PPG that year in 75 games played. So there you have it... Rick Barry certainly had more points per game than anyone in the ABA in the 1968-69 season, but he didn't play enough games to qualify as the scoring leader. The following table lists the 50 players with the most career 3PT FGs (as of November 2016). What's interesting is how few of them are in the Hall of Fame. Only two of the 50 players are currently in the HoF: Reggie Miller (#2) and Mitch Richmond (#33). The three point shot wasn't introduced until the 1979-80 season, and until recently, it wasn't heavily utilized except for those few years in the mid-90s when they shortened the arc. Consider the 84/85 season (picked at random). The league leader in 3PT FG shots was Darrell Griffith with 257 attempts. Compare that to 2005/06 season, where Ray Allen shot 653 3 PTs! Another example - Larry Bird, who was in the top 10 3 PT FG shooter for six seasons, still has less than half as many 3 PTs as someone like Shane Battier, who was not considered a high volume 3 PT shooter for his time. Those players in the 80s and 90s who were exceptional 3 PT shooters were more likely to be specialists rather than superstars. Players like MJ and Magic didn't take many 3s (especially compared to the superstars of today). The 3 PT sharpshooters like Kerr, Dell Curry, Dan Majerle and Peja were considered specialists. This has obviously changed, especially with Steph Curry. 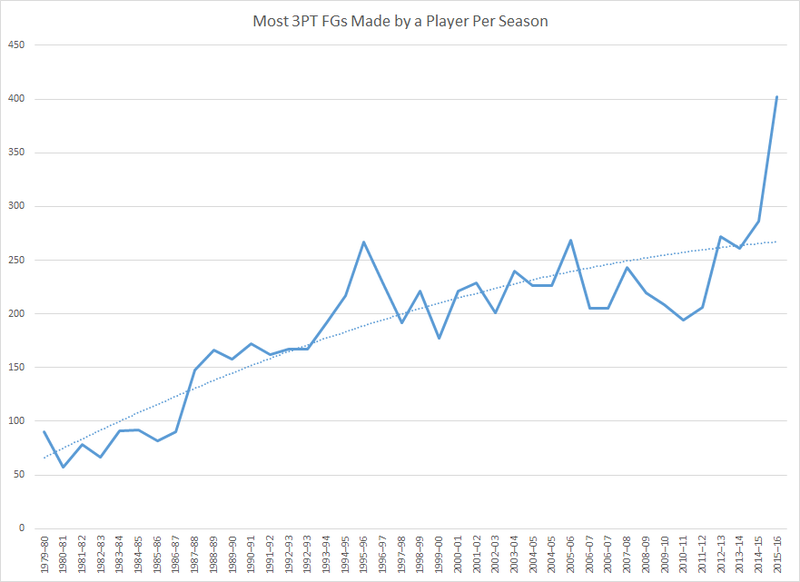 The graph below shows the most 3 PT FGs made by a player per season. As the trendline indicates, the number of made threes has been inching upward over the past 20 years and really has taken off over the past few. The first Finals MVP trophy was awarded to Jerry West of the Los Angeles Lakers at the conclusion of the 1969 NBA Finals. Since then, then have been 29 additional players to be bestowed with this award. Kareem has the greatest distance between Finals MVP awards - 14 seasons! He won his first with the Bucks in 1971 and his only other Finals MVP award with the Lakers in 1985. After that, the Miami Heat have 3 (LeBron twice and D.Wade once), as do the Pistons (Dumars, Thomas and Billups). There are two teams with 2 awards (the Rockets and Warriors) and then 9 teams with just one Finals MVP award. As you would expect, most NBA Finals MVP award winners are in the NBA Hall of Fame. There is one notable exception - the 1981 NBA Finals MVP winner, Cedric Maxwell, is currently the only NBA Finals MVP player who is eligible for the Hall of Fame but has not been inducted. The only question marks for currently non-eligible players are Chauncey Billups, Kawhi Leonard and Andre Iguodala.
" There was a lot of tension between Pat and the players. So we're about to start practice and Jason Williams comes in about ten seconds late. Pat being Pat, he starts swearing at him and screaming, "Get the hell out of here!"... I tell Pat we're a team and we need to stick together, not throw guys out of the gym. Pat is screaming at me and says if I don't like it, then I should get the hell out of practice, too. That's when I said, "Why don't you make me?" I start taking a couple of steps towards Pat. Udonis Haslem steps in and I shove him out of the way. Then Zo tries to grab me. I threw him aside like he was a rag doll. Now it's me and Riley face-to-face, jaw to jaw. I'm poking him in the chest and he keeps slapping my finger away and it's getting nasty. " Shaq was on the block by the end of the week. On February 6, 2008, Shaq is traded to the Suns for Shawn Marion and Marcus Banks. Now with Shaq gone after a year and Mourning recently retired, the Heat needed a third big man alongside Joel Anthony and Mark Blount . On February 13, 2009, Heat trade Shawn Marion and Marcus Banks from the Suns, for Jermaine O’Neal, Jamario Moon, a 2010 2nd round pick and 2011 first round draft pick. They now have the back up big man they need, and 3 trade assets in Moon and two draft picks. With the Cavs needing a back-up small forward behind LeBron James, they sign Moon to an offer sheet on July 17, 2009, which Miami chooses not to match. Come 2011, the Clippers are no longer interested in their ageing and mildly productive point guard Baron Davis and need a younger point guard, as well as a small-forward considering they only had one prior to drafting Al-Farouq Aminu. On February 24, 2011, they trade Baron Davis and a first round pick for Mo Williams, and the only other player on the Cavs roster that fits within their needs, Jamario Moon. Come May 17 and its the NBA Draft Lottery. Cavs have a 19.9% chance of winning the first pick with their own, and a mere 2.8% with the Clippers pick. By half a stroke of a miracle, the Clipper's pick that was gifted in an almost meaningless trade ends up being the number 1 pick. On June 23rd, 2011, that pick turns into Kyrie Irving. TL;DR - Jason Williams rocks up late to practice, results in a fight between Pat Riley and Shaq that ends in Shaq being traded. Causes a ripple effect of trades that ends up with Clippers trading away a first round pick that turns into Kyrie Irving. Ethereal theme. Theme images by emyerson. Powered by Blogger.